Former ABC managing director Mark Scott speaks at the graduation ceremony. Former ABC managing director Mark Scott is among three public leaders to have been awarded honorary doctorates in recognition of their eminent service to the community. Scott, who was recently appointed secretary of the NSW Department of Education, was awarded an honorary Doctor of Business for his eminent service to UNSW and the community. Reading Scott’s citation UNSW Chancellor David Gonski AC described him as “a visionary leader who boldly transformed the ABC from a traditional media organisation into a leading player in Australia’s new media and digital landscape”. Scott engineered extensive changes to the broadcaster with the introduction of ABC News 24, Australia’s first free-to-air 24-hour news channel; ABC 3, a digital TV channel for children, and a major expansion into digital and online technology which included the roll out of digital radio. He was named an Officer of the Order of Australia in 2011 for his distinguished service to media and communications, and to the community through his advisory and governance roles with a range of social justice and educational bodies. As a long-standing member of the UNSW Business School Advisory Council and Executive Committee, Scott provides advice to the Dean and interviews high profile business CEOs as part of the School’s flagship alumni event series, Meet the CEO. 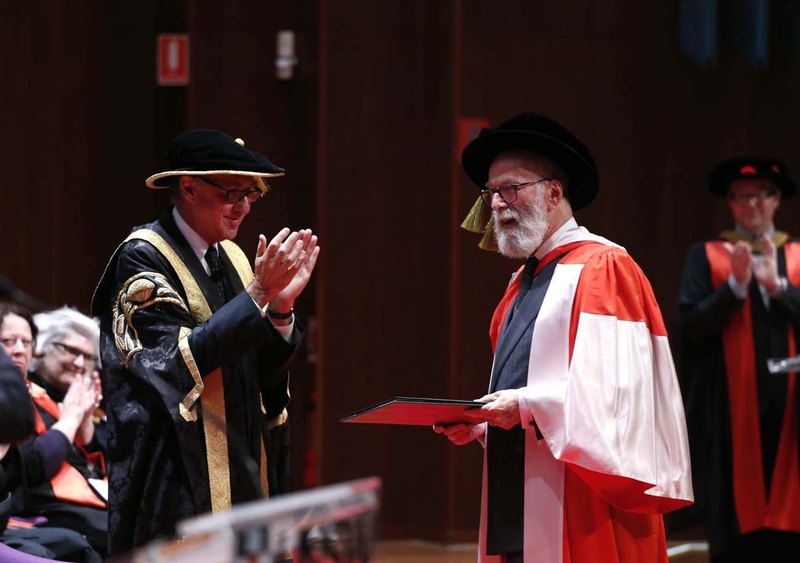 Also recognised in UNSW’s Winter Graduations was prominent arts patron and philanthropist John Kaldor, who was awarded an honorary Doctor of Letters. Kaldor has brought innovative art to Australia for over 45 years through his not-for-profit organisation Kaldor Public Art Projects. In 2008 he donated the John Kaldor Family Collection to the Art Gallery of NSW – the most significant and influential gift the Gallery has received in its more than 140-year history. Kaldor has worked closely with the Museum of Contemporary Art, is a former Board member of the Sydney Biennale and a former Trustee of the Art Gallery of NSW, and a member of London Tate's International Committee and the Museum of Modern Art in New York’s International Council. “Today, thanks to the generosity of John and his family we, the public, have ready access to enjoy the works of such internationally significant artists as Robert Rauschenberg, Christo, Sol LeWitt and Jeff Koons,” said Gonski. Former Federal Court judge and UNSW alumna The Honourable Annabelle Bennett was recognised with an honorary Doctor of Laws. Annabelle served as a Judge of the Federal Court of Australia for the last 13 years. She also served as a Judge of the Supreme Court of the ACT, President of the Copyright Tribunal of Australia, and a Presidential Member of the Administrative Appeals Tribunal. Bennett has been an active contributor to the greater community through myriad roles beyond the court room – as a member and former President of the Australian Academy of Forensic Sciences, and as a member of the Genetic Manipulation Advisory Committee, the Biotechnology Task Force, the Pharmacy Board of New South Wales and the Eastern Sydney Area Health Service. In 2016, she was appointed Chancellor of Bond University. On awarding her honorary degree the Chancellor recognised Bennett’s “generous benefactions to our cultural and scientific landscape and to the many areas benefiting from her fierce intellect and energy”. Fierce intellect and energy – UNSW alumna and former Federal Court judge The Honourable Annabelle Bennett is awarded her honorary doctorate. Also graduating last week was one of the foremost international researchers on coal geology and petrology, UNSW alumnus Professor Colin Ward, who received a special Doctor of Science, awarded on the basis of a significant body of published scholarly work that establishes the candidate as a distinguished authority in an area of research, commanding worldwide recognition. Ward served as the Head of UNSW’s Department of Applied Geology and later the School of Geology. Following retirement in 2006, he was appointed an Honorary Professor in the School of Biological, Earth and Environmental Sciences and has continued to undertake a substantial research program, supervise students and teach. The Chancellor noted the industry’s high respect for Ward and the fact that “he has exemplified the UNSW tradition of translating high-calibre fundamental and applied research into practical applications”. Ward has received numerous accolades, culminating in the Gilbert H. Cady award by the Geological Society of America in 2010 and the John Castaño Honorary Membership Award from the Society for Organic Petrology in 2012. He is also author of the classic textbook Coal Geology and Coal Technology. 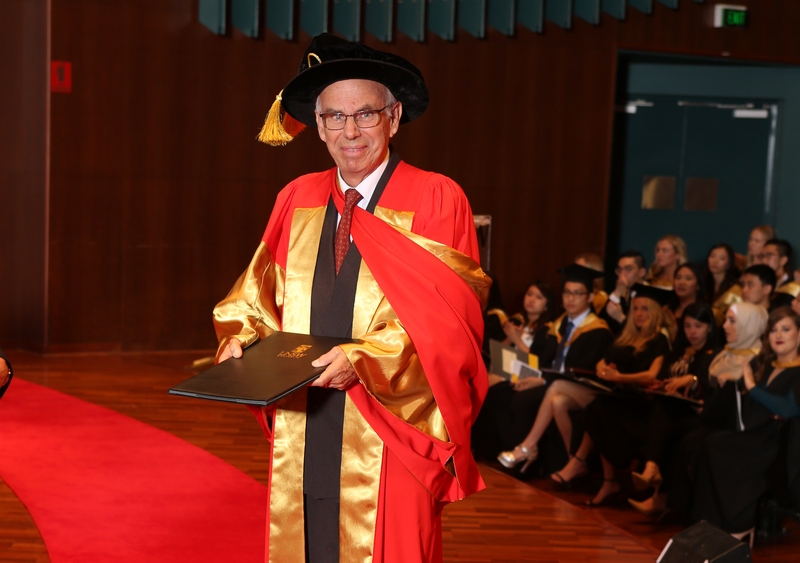 International coal geology and petrology researcher UNSW alumnus Professor Colin Ward graduates with a special higher degree, Doctor of Science.